This first story takes me back six years when I first became involved in basic healthcare activism for Africa. 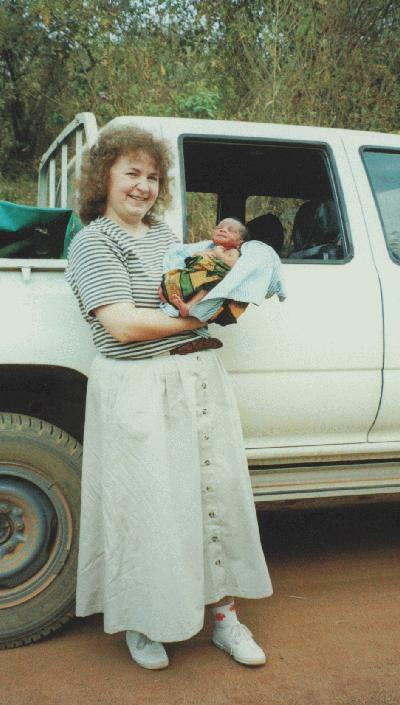 This story comes from my mother’s first trip to Uganda in 2001. My family became very good friends with Fr. Joseph from Uganda in the summer of 2000. He dealt with many medical issues in his traveling from village to village fulfilling his priestly duties, but he did not have any medical background. He asked my mother, who is a registered nurse, medical questions when he was here and sometimes called from Uganda to ask the best medical procedure or prognosis. She had found it very difficult since we had such a limited knowledge of what conditions were like in Uganda. So, that following summer my mother made the journey across the ocean to see the medical situation first hand. While she was there the realities were painfully obvious. Fr. Joseph owned a donated Toyota pick-up truck and while my mom was there she traveled around with him on his day to day work. An important note to make is that the pick-up truck doubled as the area ambulance. On one particular day, at a village stop to give mass, a pregnant mother needed transportation to the hospital because there were some complications. The nearest health clinic was seven hours away on the red, dusty, hole ridden ‘roads’. I can only imagine the ride in the back of a pick-up truck, dust thrown about, bouncing along so that a child may have a better chance. En route the pregnant mother went into labor. Still hours from the hospital the mother gave birth to a healthy baby girl and then died. They decided to name the baby after my mother – Baby Elizabeth. A family from the village adopted baby Elizabeth and she seemed to have a good chance in the world. Later the next year we were told that baby Eilzabeth had died. She had contracted malaria and since she lived in such a remote village, she and her family had no access to the $1- $2 medication that could have saved her life. If the access had been there baby Elizabeth might have lived to her fifth birthday, a rare occurance in many African communities due to poverty and disease. 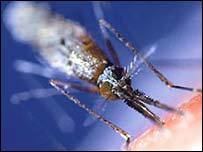 Malaria is a parasite that is carried from human to human by mosquito. Malaria is a very preventable disease, yet kills over a million people each year. Over 90% of malaria deaths occuring in Africa making it Africa’s leading cause of death for children under five. Just recently President George W. Bush has said eight more African countries have joined a $1.2 billion US program to fight malaria. The five-year program works to provide funds to limit malaria’s spread by using insecticides and anti-mosquito bed nets, and also to provide drugs to people already infected. The renewed enthusism for the program has brought the World Bank and billionaire philanthropist, Bill Gates on board. Also on the scene are recent scientific advances, such as progress towards a vaccine, which prove to offer great hope to defeating one of the world’s great killers. A new treatment developed by British scientists collaborating with Kenyan experts is based on a technique for fluid replacement for children ill with malaria. The problem is that intensive care methods, only available at pediatric units in developed countries, is needed to treat infected children. It is estimated that through partnerships working in Uganda, Tanzania, and Angola – US taxpayers already have helped approximately 6 million people to treat and prevent malaria. There are great hopes for the future prevention and defeat of malaria, but it requires the continued support of people in the developed world. US taxpayers need to push the Bush administration and future adminstrations to remain dedicated to the mission of saving lives affected by preventable disease. President Bush also announced at the Washington Summit on Malaria that the US Volunteers for Prosperity program will be expanded to recruit skilled US volunteers, doctors, and nurses to travel to at-risk countries to train local health care workers. The Gates Foundation has also expanded the number of projects it funds to research new malaria treatments. Likewise, there is a large private sector effort, such as, Nothing But Nets and the Acumen Fund, among others. Check out the blog of an Acumen Fellow working with a mosquito net facotry in Tanzania. There are so many opportunites to donate, to get involved, to volunteer, and to save a life. Check out some of the links posted and make a difference today! Next Next post: america and the greatest humanitarian crisis of our time and our children’s?